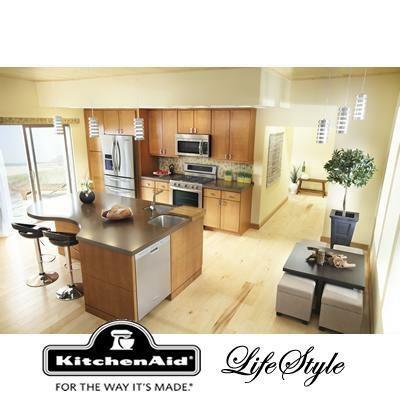 KitchenAid Architect® Series II 30-inch freestanding range with warming drawer. The Even-Heat™ technology features advanced heating technologies to evenly disperse heat inside the oven. During Even-Heat™ Preheat, the entire oven heats to the correct temperature. And true convection circulates heated air over, under, and around all three racks for perfectly baked centers with no burnt edges. The AquaLift™ self-clean technology removes the most common concerns about self-cleaning cycles: time, odor, and temperature. An exclusive oven coating utilizes low heat and water to release baked-on spills. As a result, you can clean your oven in less than an hour without odors and at a temperature below 250°F. Additional Information Even-Heat™ Technology: features advanced heating technologies to evenly disperse heat inside the oven. 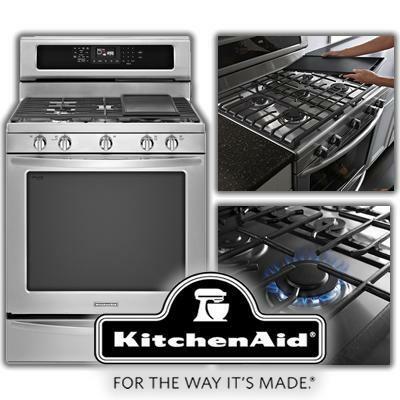 During Even-Heat™ Preheat, the entire oven heats to the correct temperature. And true convection circulates heated air over, under, and around all three racks for perfectly baked centers with no burnt edges. AquaLift™ Self-Clean Technology: Removes the most common concerns about self-cleaning cycles: time, odor, and temperature. An exclusive oven coating utilizes low heat and water to release baked-on spills. 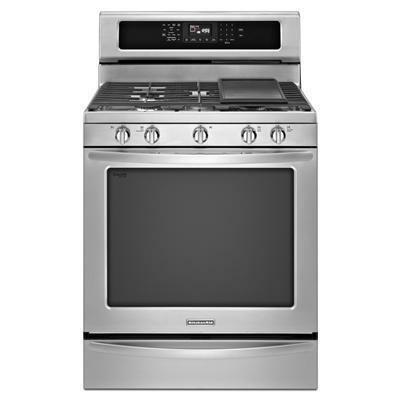 As a result, you can clean your oven in less than an hour without odors and at a temperature below 250°F; Stainless Steel Cooktop with 18K BTU Professional Burner: The stainless steel surface matches the range and features a powerful 18,000 BTU burner for high-temperature cooking methods such as searing, stir-frying, and wok cooking. The burner reduces to a low output for simmering sauces; ClearVue™ Large Viewing Window; SatinGlide™ System; Non-Stick Griddle. Burners/Elements Output Center Rear Brnr High Nat: 8000 BTU;	Left Front Brnr High Nat: 18000 BTU;	Left Rear Brnr High Nat: 9500 BTU; Right Front Brnr High Nat: 15000 BTU;	Right Rear Brnr High Nat: 5000 BTU. Additional Dimensions 27 7/8" (70.8 cm) max. depth with handle. Warranty 1 Year. Second through fifth years limited warranty on certain componenet parts.